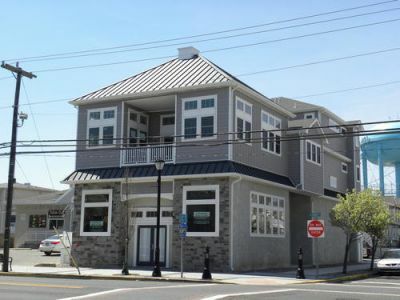 3900 Landis Ave., (Unit Unit C), Sea Isle City, NJ - Farina & Boeshe Real Estate Co. Brand New Construction!!!! Beautiful 5 bedrooms 3 full bathrooms and 2 powder rooms. The main living area, kitchen and dining area are on the second level along with a Master Bedroom with a Queen bed and full bath. The kitchen has a large island seating for 8 people. Dining table seats 8 as well. The 3rd floor has a Master Suite with full bath. A large sitting area and a separate kitchen and dining area for 4 along with a powder room. The large covered deck is also on this floor. This unit comes with 1 designated parking space and a SIC parking pass to park your additional car on the street. The security deposit for this unit is $650.00.